This is one of those gadgets you can only get away with if you’re either married, very old or completely shameless. 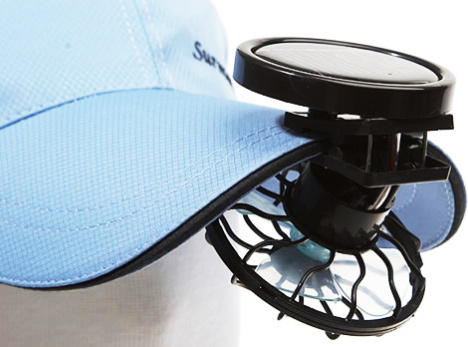 It is a solar fan which attaches to the bill of your hat to keep you cool while out antiquing or whatever it is people do that wear strange hats. This ranks up there with the umbrella hats, both of them are just not right. I realize when it is extremely hot and you’re stuck outdoors you have to do anything you can just to keep cool. However, I’ll take a bandanna that’s been sitting in the freezer any day over this sort of thing. That or if you’re female you can just store your underwear in the freezer. Then you don’t look like a dork who just bought an attachment for their hat. You just are secretly wearing undies that double as a Popsicle. The fan is being sold by Brando for $10. It also has no battery, so if you’re planning on a hot evening, you’re out of luck.